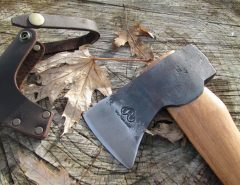 Having an axe is a great thing, and even though it is simple tool the best ones are hard to find. 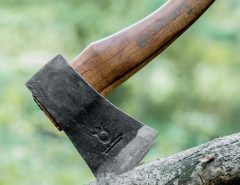 When it comes to finding a good axe most of you have either went without an axe or have spent a lot of money on one, or have possibly found an old model and have restored it to working condition. 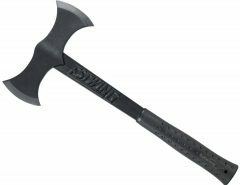 The Cold Steel Trail Boss is one of the best attempts seen to give a good quality axe for a reasonable price, so you have to struggle with the other options. Time will tell if the attempt was worth it. The most attractive part about this axe will be the price. It is really cheap when compared to a Gransfors Bruks axe or wetterlings axe. Of course, when it comes to buying an axe that is cheaper than the competitors, quality will be a big concern. This is what made me want to purchase one and see if it was worth the price. Anyway, sometimes we abuse our tools even though we know we shouldn’t so I’d rather abuse a cheap axe than one of my more expensive axes. With respect to the specifications, it is very similar to a Gransfors Bruks. 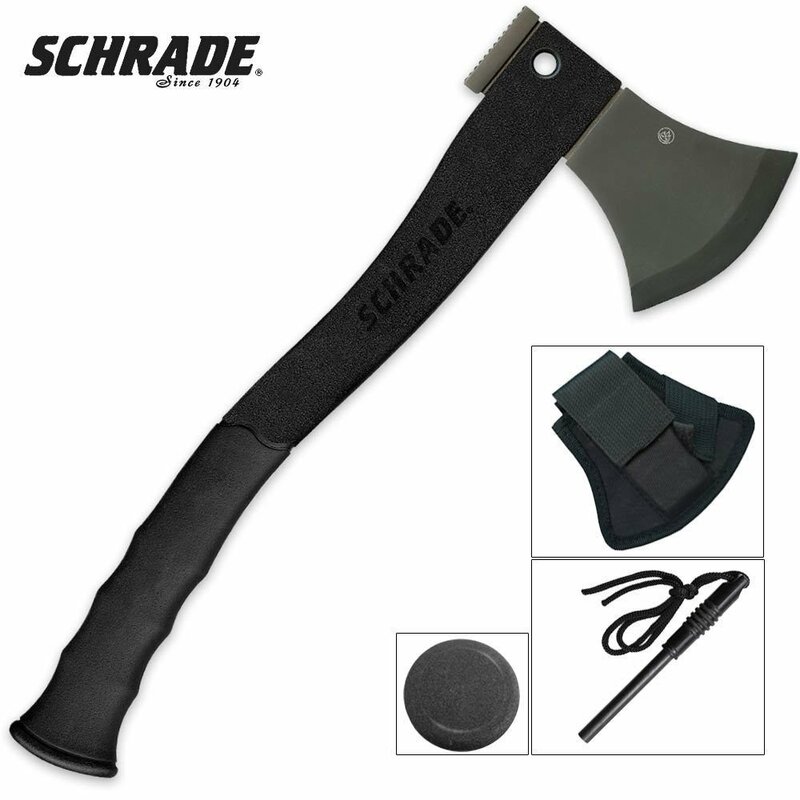 The head of the axe is attached to the handle using a metal cylinder. The top of the head is painted black to make everything match the head of the axe. It may look like the cutting edge isn’t aligned, but after measuring, I found out that it is quite centered. The grind is similar to a Gransfors Bruks but the edge of the Trail boss is thicker than the other, which decreases the chopping performance. The part of the axe head that is below the cutting edge is actually less concave which makes it better at splitting wood. The balance of the Trail boss isn’t that great. When you hold it by the handle near the head, it is balanced but the head is heavy toward the bit, which means that whenever you hold it like that, the cutting edge will point almost completely down due to it being heavier than the rest of the head. Which in turn makes the axe harder to control during the swing. The longer that the axe is the more of a difference it will make. For those who are all about using axes, this could be an issue. The grain of the handle is good. Normally, you would want straight grain through the whole handle, but the Trail Boss has somewhat wavy grain which means that it isn’t perfect, but it will work. The steel is good quality and it keeps its edge quite well and it can be easily sharpened. The steel isn’t prone to chipping. If you are planning to use this model as a chopper, then you need to spend some time with a file and thin out the edge. The cheeks are thin and nice, and the only part that needs to be thinned is near the cutting edge. 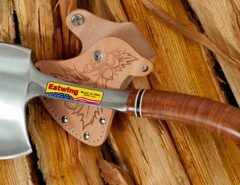 With all of the above being considered, I would recommend the Cold Steel Trail Boss Hickory Handle axe. This model out performs the price tag and it is a good tool. 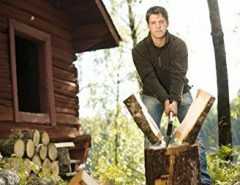 I still much prefer the Fiskars X15 or the Husqvarna Curved Handle Multipurpose Axe.